This is your chance to contribute to the next edition of Our Portland Story! We will have a recording station set up for anyone who wants to schedule a quick 5 minute oral recording session. You can bring a friend or family member to conduct an interview, or simply record an oral story on your own. Stories should be concise and focus on one aspect of Portland that has meaning to you (a historical event, inspiring person, or perfect place). Stories chosen for Our Portland Story Volume 3 will be transcribed and an editor may follow up with further requests. You must SCHEDULE an appointment ahead of time to ensure that you will be able to participate! 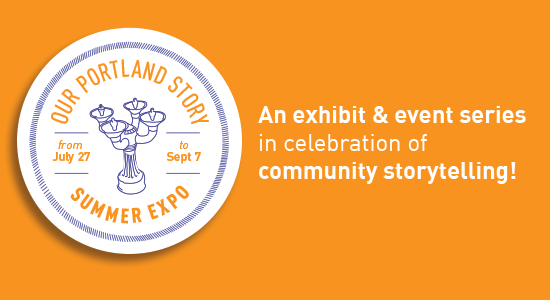 This event is the LAST in the Our Portland Story Summer Expo series – a celebration of community storytelling. View full line up of past events! Peer into the depths of The Cabinet of Curiosity exhibition at the Museum of Contemporary Craft which features wild, weird and familiar objects pulled straight from the pages of Volumes 1 &2. Discover old Portland concert posters, historical artifacts and cultural oddities! All objects are mapped and reference page numbers so you can dive deeper into the stories behind all of the objects. On Location, the new addition to the Our Portland Story exhibition, opened on August 31st featuring a large-scale Portland map populated with flags representing important places referenced in Our Portland Story Volumes 1 & 2. The map is interactive and will be awaiting your location-based Portland story. The buildings, parks, bridges, scenic areas, restaurants and public squares are the backdrop of ALL of our Portland stories. What story will you write? Add yours and you will be contributing to the growth of the exhibit which will be live (and allowing contributions) at Museum of Contemporary Craft until September 16th. 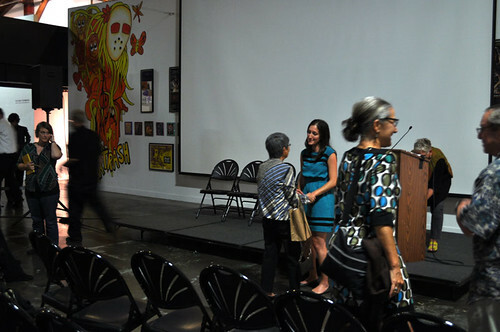 Huge thanks to Joan Lundell for design and planning support, and to Sarah Margolis-Pineo for her work & support of the Expo! A new addition to the Our Portland Story exhibition opens on the 31st and features a large-scale map populated with flags representing important places referenced in Our Portland Story Volumes 1 & 2. 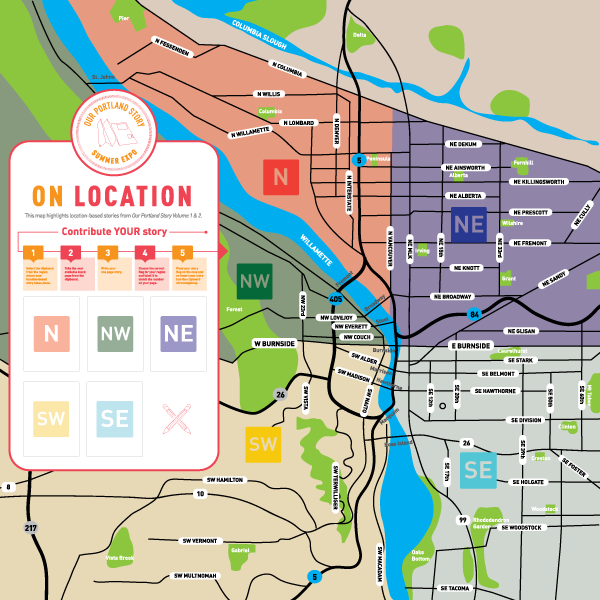 The map is interactive and will be awaiting your location-based Portland story. What story will you write? A story of your first kiss at Oaks Park? Your favorite St. Johns dive bar? Your secret bench on the Esplanade? The buildings, parks, bridges, scenic areas, restaurants and public squares are the backdrop of ALL of our Portland stories. Add yours and you will be contributing to the growth of the exhibit which will be live (and allowing contributions) at Museum of Contemporary Craft until September 16th. We will supply paper, writing supplies, tables and chairs. Write your story, plant your flag on the map and watch it grow. Leave your story for all museum guests to enjoy and be inspired by (take a photocopy if you’d like). Some story authors will be selected to expand their story for inclusion in Volume 3. This event is the fourth in the Our Portland Story Summer Expo series – a celebration of community storytelling. View full Expo event line up! Still on view: The Cabinet of Curiosity brought to you by Our Portland Story and the Museum of Contemporary Craft. Peer into the depths of “Cabinet” which features wild, weird and familiar objects pulled straight from the pages of Volumes 1 &2. Discover old Portland concert posters, historical artifacts and cultural oddities! All objects are mapped and reference page numbers so you can dive deeper into the stories behind all of the objects. MoCC, in partnership with Pacific Northwest College of Art is a vibrant center for investigation and dialogue that helps expand the definition and exploration of craft. Founded in 2008, Our Portland Story is an ongoing story collection project that seeks to cultivate a greater sense of community. The Our Portland Story publication, now in its second volume, pairs local storytellers with designers to create artful snapshots that capture the spirit of the city. Join us for a dynamic comedy showcase inspired by Our Portland Story and brought to you by Brody Theater and local improv comedy group, horseplaygroundmeat. Kicking off with improv at 1pm, the group will pull prompts from the book, Our Portland Story Volume 1, and audience suggestions. Up next, local stand-up comedians: Stephanie Purtle, Whitney Streed, Jason Traeger and Christian Ricketts take over the mic offering their own hilarious perspectives of our city. Ending the afternoon is a sketch comedy set inspired by Portland featuring Starr Ahrens, Neven Mrgan, and Mike Karras (includes performances from Brody’s recently sold out production of How to Age Disgracefully). Who would guess the wild and weird side of Portland would inspire the best comedy? Let’s laugh and unite about the things that make our city ridiculously funny. Arrive promptly at 1pm to catch the whole whole show, or stop in anytime between 1-3pm. Thanks to Brody Theater, Chad Rea and horseplaygroundmeat for their partnership on this event! This event is the third in the Our Portland Story Summer Expo series – a celebration of community storytelling! 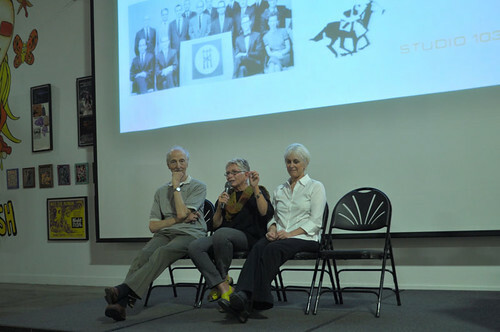 Follow-up events include everything from a writing workshop to an investigation of stories associated with place. With all events, we hope to use the power of story to see our city through another’s eyes. View full Expo event line up! On Saturday August 10th, Our Portland Story and the Museum of Contemporary Craft invite school-age kids and adults with a creative spirit to imagine and craft their perfect place. The place could be a fort, playhouse, park, treehouse, hobbit hole, outer space planet or any structure designed for escape, play or comfort. 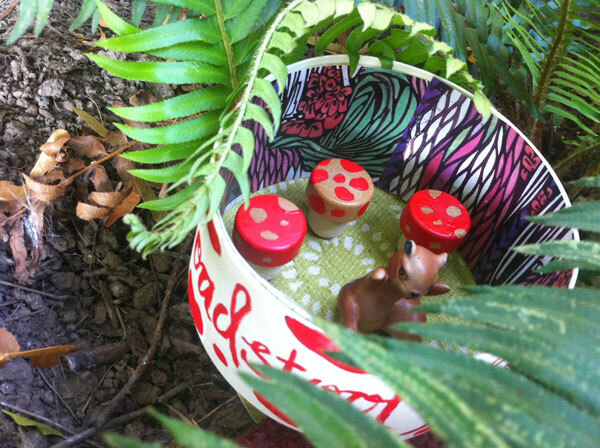 Create this place – in diorama form – using provided recycled objects (from S.C.R.A.P.) and arts and crafts materials. Upon completion, your unique place will be photographed and shared on OurPortlandStory.com. Melissa Delzio & Joan Lundell from Our Portland Story will be on hand to facilitate. Come by anytime between 1pm and 3pm – but leave yourself plenty of time to get crafty. Imagination required. This event is the second in the Our Portland Story Summer Expo series – a celebration of community storytelling! Follow-up events include everything from an improv show based off Our Portland Story narratives to an investigation of stories associated with place. With all events, we hope to use the power of story to see our city through another’s eyes. 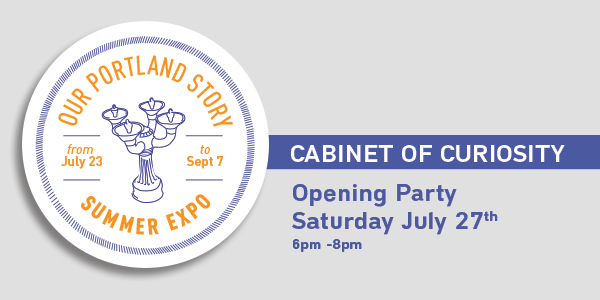 You’re invited to the opening party for the exhibition, Cabinet of Curiosity brought to you by Our Portland Story and the Museum of Contemporary Craft. Plus get a first look at the nearly-published Volume 2! All completed pages will be on view as a part of the “Cabinet” exhibition. The evening kicks off at 6pm, with readings by Our Portland Story Volume 2 authors, Bridget Pilloud, John & Vivian Parker, Kristin Thiel and more! Peer into the depths of “Cabinet” which features wild, weird and familiar objects pulled straight from the pages of Volumes 1 &2. Discover old Portland concert posters, historical artifacts and cultural oddities! All objects are mapped and reference page numbers so you can dive deeper into the stories behind all of the objects. Stick around, enjoy a Hopworks brew, and live music by local band, Father’s Pocket Watch. If you miss the event, don’t fret. “Cabinet” will be on view July 23rd – September 7th. This event serves as the kick-off for the Our Portland Story Summer Expo – a celebration of community storytelling! Follow-up events include everything from an improv show based off Our Portland Story narratives to an investigation of stories associated with place. With all events, we hope to use the power of story to see our city through another’s eyes. 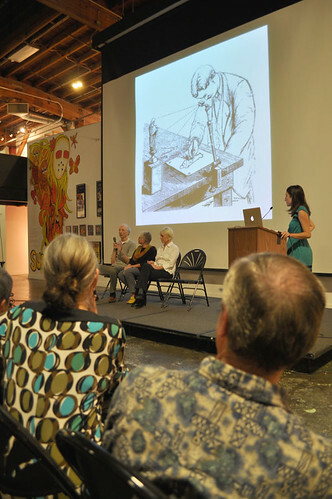 The Museum of Contemporary Craft and Our Portland Story announce an exhibit and event series in celebration of community storytelling! The exposition kicks off with the exhibit, “Cabinet of Curiosity” on view July 23rd – September 7th. “Cabinet” will feature wild, weird and familiar objects pulled straight from the pages of Our Portland Story Volumes 1 &2. Follow up events include everything from an improv show based off Our Portland Story narratives to an investigation of stories associated with place. With all events, we hope to use the power of story to see our city through another’s eyes. Kids, imagine your perfect place, a place of escape for play or comfort. Could be a fort, playhouse, park, treehouse, hobbit hole or outer space planet. Create your perfect place – in diorama form – using the provided found objects (from S.C.R.A.P.) and arts and crafts materials. Bring your parents and your imagination! A dynamic improv showcase inspired by Our Portland Story and audience prompts brought to you by local improv group horseplaygroundmeat and an additional Portland-inspired comedy line-up brought to you by the Brody Theater. Artifacts and everyday heirlooms fill our homes and have special meaning for those who know their stories. Bring an everyday heirloom from home to the museum and take time to put the meaning and the story to paper. Local writing teacher, Scott Landis will provide instructions, prompts or storytelling guidance. Keep a copy of your finished story and leave a copy at the museum to share. 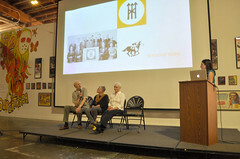 An opening of part 2 of the Our Portland Story exhibit – “On Location”. This new addition to the exhibit features a large-scale map of important places referenced in Our Portland Story Volume 1 & 2. From locations of favorite dive bars to the spot of a first kiss, all will be geographically revealed. This map is interactive and will be awaiting your contribution. Write or bring a short story about one particular Portland location and place a numbered pin of that location on the map. Leave your story for all museum guests to enjoy and be inspired by! This is your chance to contribute to the next edition of Our Portland Story! We will have a recording station set up for any who want to schedule a quick 5 minute recording session. You can bring a friend or family member to conduct an interview, or simply record an oral story on your own. Stories should be concise and focus on one aspect of Portland that has meaning to you (a historical event, inspiring person, or perfect place) Stories chosen for Our Portland Story Volume 3 will be transcribed and an editor may follow up with further requests. You must SCHEDULE an appointment ahead of time to ensure that you will be able to participate! 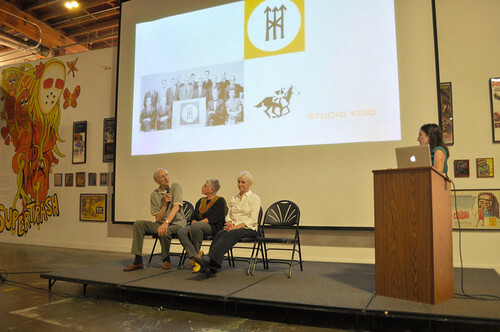 The MoCC + Our Portland Story Summer Exposition will coincide with the launch of the printed book, Our Portland Story Volume 2 – the second edition of “Portland’s yearbook”.